Bud & I always laugh at each other when, after we finish a school, one of us always says “This is the best group of people yet.” That’s the way that we feel right now. We had people from 22 states and 3 Canadian provinces attend. Their interests included beef, dairy, buffalo, swine, goats, feedlot, heifer development – in other words, a typical Bud Williams Stockmanship School student body. It seems like we are getting more and more Veterinarians attending our programs. Do you think that the industry is finally starting to believe that the emotions of the animals are something that must be taken into account if we expect them to be healthy and productive? 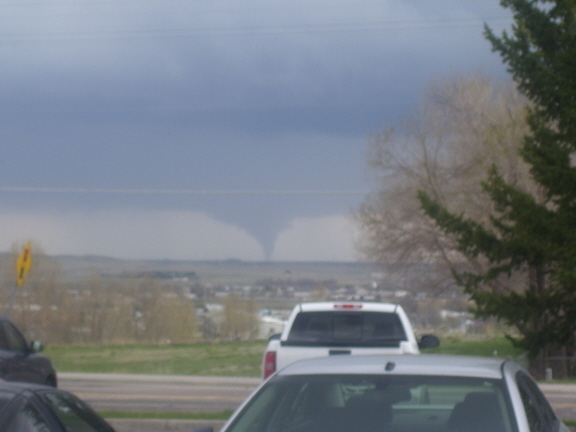 We have lived in “Tornado Alley” off and on for several years, but the only tornados I have seen were in Alberta Canada, and just last week in Cheyenne. This picture was taken from our hotel. There are not enough words to say thank you for the most wonderful, thought-provoking, conversation-stimulating and life changing meeting/educational experience I have ever attended. Being able to attend with two of my clients/co-workers and seeing the excitement and eagerness to “do things properly because they should be done,” as Bud would say, was the most rewarding and fulfilling experience of my practice career. I only wish I could have brought all of my clients. We are all looking forward to implementing improvements to our operations and lives to get to where we now know our cattle and we should be. Thank you so much. that wasn’t from sickness. That calf was healthy as a horse on a Sunday and running and bucking and eating and dead the next morning. I think it must have been an aneurysm or heart attack.